Roxanne, you don't have to put on the red light...In this house, it's been put on for you! The first benefit of this beautiful vacation home is that you can't miss it driving down the road! Conveniently located in the heart of Kill Devil Hills, you are just a stone's throw away from some of our favorite restaurants, historic sites and family attractions. RoxSand offers so many wonderful amenities, including the Avalon Pier and beach access right at the end of your road. With spacious decking, your whole family will certainly enjoy the great weather - morning java and evening cocktails. If you decide to spend the day by the pool, just open the door from the lower level game room and be greeted by the sparkling waters. After dinner at your favorite local restaurant, come home and play an entertaining game of foosball or watch a movie together in the cozy living room. Later, after the kids are in bed, climb into the soothing hot tub under a night sky of stars! 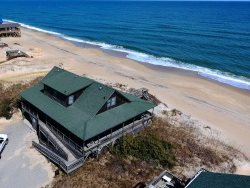 RoxSand - you will fall in love with the Outer Banks over and over again! NOTE: NO PETS. NO SMOKING. Need more room for your group? Consider also renting POPPA'S PLACE. These two homes are only a couple of houses apart.